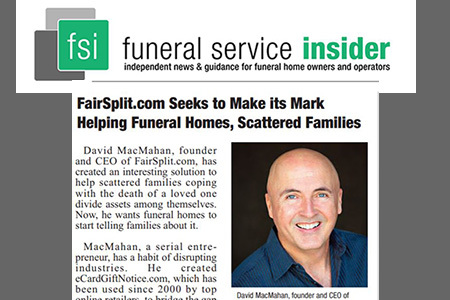 David MacMahan, founder and CEO of FairSplit.com, has created an interesting solution for helping funeral homes in turn, help scattered families coping with the death of a loved one divide assets among themselves. Now, he wants funeral homes to start telling families about it. industries. He created eCardGiftNotice.com, which has been used since 2000 by top online retailers, to bridge the gap between an order and delivery for time-sensitive event giving. The memory of the challenges dividing my father’s things helped me really understand that there are challenges to dividing emotionally valued items, and those often far outweigh the challenges of things that have some higher dollar value. And though my own divorce was mostly peaceful, there was still a need to create two homes from the contents of one, and have things be familiar for the kids. That made it hard, and walking through a home dividing things from a marriage that didn’t work is just sad and puts a couple in an emotionally raw place that there is just no reason to go to if not needed.